According to Professor David Blight of the Yale University History Department, the first memorial day was observed in 1865 by liberated slaves at the historic race track in Charleston. The site was a former Confederate prison camp as well as a mass grave for Union soldiers who had died while captive. The freed slaves reinterred the dead Union soldiers from the mass grave to individual graves, fenced in the graveyard & built an entry arch declaring it a Union graveyard; a very daring thing to do in the South shortly after North's victory. On May 30 1868 the freed slaves returned to the graveyard with flowers they'd picked from the countryside & decorated the individual gravesites, thereby creating the 1st Decoration Day. A parade with thousands of freed blacks and Union soldiers was followed by patriotic singing and a picnic. Memorial Day is not actually a day to pray for U.S. troops who died in action but rather a day set aside by Congress to pray for peace. The 1950 Joint Resolution of Congress which created Memorial Day says: "Requesting the President to issue a proclamation designating May 30, Memorial Day, as a day for a Nation-wide prayer for peace." (64 Stat.158).Peace today is a nearly impossible challenge for the United States. The U.S. is far and away the most militarized country in the world and the most aggressive. Unless the U.S. dramatically reduces its emphasis on global military action, there will be many, many more families grieving on future Memorial days.The U.S. spends over $600 billion annually on our military, more than the rest of the world combined. China, our nearest competitor, spends about one-tenth of what we spend. The U.S. also sells more weapons to other countries than any other nation in the world.The U.S. has about 700 military bases in 130 countries world-wide and another 6000 bases in the US and our territories, according to Chalmers Johnson in his excellent book NEMESIS: THE LAST DAYS OF THE AMERICAN REPUBLIC (2007).The Department of Defense (DOD) reports nearly 1.4 million active duty military personnel today. Over a quarter of a million are in other countries from Iraq and Afghanistan to Europe, North Africa, South Asia and the rest of the Western Hemisphere. The DOD also employs more than 700,000 civilian employees.The US has used its armed forces abroad over 230 times according to researchers at the Department of the Navy Historical Center. Their publications list over 60 military efforts outside the U.S. since World War II.While the focus of most of the Memorial Day activities will be on U.S. military dead, no effort is made to try to identify or remember the military or civilians of other countries who have died in the same actions. For example, the U.S. government reports 432 U.S. military dead in Afghanistan and surrounding areas, but has refused to disclose civilian casualties. "We don't do body counts," General Tommy Franks said.Most people know of the deaths in World War I - 116,000 U.S. soldiers killed. But how many in the U.S. know that over 8 million soldiers from other countries and perhaps another 8 million civilians also died during World War I?By World War II, about 408,000 U.S. soldiers were killed. World-wide, at least another 20 million soldiers and civilians died.The U.S. is not only the largest and most expensive military on the planet but it is also the most active. Since World War II, the U.S. has used U.S. military force in the following countries:1947-1949 Greece. Over 500 U.S. armed forces military advisers were sent into Greece to administer hundreds of millions of dollars in their civil war.1947-1949 Turkey. Over 400 U.S. armed forces military advisers sent into Turkey,1950-1953 Korea. In the Korean War and other global conflicts 54,246 U.S. service members died.1957-1975 Vietnam. Over 58,219 U.S. killed.1958-1984 Lebanon. Sixth Fleet amphibious Marines and U.S. Army troops landed in Beirut during their civil war. Over 3000 U.S. military participated. 268 U.S. military killed in bombing.1959 Haiti. U.S. troops, Marines and Navy, land in Haiti and joined in support of military dictator Francois "Papa Doc" Duvalier against rebels.1962 Cuba. Naval and Marine forces blockade island.1964 Panama. U.S. troops stationed there since 1903. U.S. troops used gunfire and tear gas to clear US Canal Zone.1965-1966 Dominican Republic. U.S. troops land in Dominican Republic during their civil war - eventually 23,000 were stationed in their country.1969-1975 Cambodia. U.S. and South Vietnam jets dropped more than 539,000 tons of bombs on Cambodia - three times the number dropped on Japan during WWII.1964-1973 Laos. U.S. flew 580,000 bombing runs over country - more than 2 million tons of bombs dropped - double the amount dropped on Nazi Germany. US dropped more than 80 million cluster bombs on Laos - 10 to 30% did not explode leaving 8 to 24 million scattered across the country. Since the war stopped, two or three Laotians are killed every month by leftover bombs - over 5700 killed since bombing stopped.1980 Iran. Operation Desert One, 8 U.S. troops die in rescue effort.1981 Libya. U.S. planes aboard the Nimitz shot down 2 Libyan jets over Gulf of Sidra.1983 Grenada. U.S. Army and Marines invade, 19 U.S. killed.1983 Lebanon. Over 1200 Marines deployed into country during their civil war. 241 U.S. service members killed in bombing.1983-1991 El Salvador. Over 150 US soldiers participate in their civil war as military advisers.1983 Honduras. Over 1000 troops and National Guard members deployed into Honduras to help the contra fight against Nicaragua.1986 Libya. U.S. Naval air strikes hit hundreds of targets - airfields, barracks, and defense networks.1986 Bolivia. U.S. Army troops assist in anti-drug raids on cocaine growers.1987 Iran. Operation Nimble Archer. U.S. warships shelled two Iranian oil platforms during Iran-Iraq war.1988 Iran. US naval warship Vincennes in Persian Gulf shoots down Iranian passenger airliner, Airbus A300, killing all 290 people on board. US said it thought it was Iranian military jet.1989 Libya. U.S. Naval jets shoot down 2 Libyan jets over Mediterranean1989-1990 Panama. U.S. Army, Air Force, and Navy forces invade Panama to arrest President Manuel Noriega on drug charges. U.N. puts civilian death toll at 500.1989 Philippines. U.S. jets provide air cover to Philippine troops during their civil war.1991 Gulf War. Over 500,000 U.S. military involved. 700 plus U.S. died.1992-93 Somalia. Operation Provide Relief, Operation Restore Hope, and Operation Continue Hope. Over 1300 U.S. Marines and Army Special Forces landed in 1992. A force of over 10,000 US was ultimately involved. Over 40 U.S. soldiers killed.1992-96 Yugoslavia. U.S. Navy joins in naval blockade of Yugoslavia in Adriatic waters.1993 Bosnia. Operation Deny Flight. U.S. jets patrol no-fly zone, naval ships launch cruise missiles, attack Bosnian Serbs.1994 Haiti. Operation Uphold Democracy. U.S. led force of 20,000 troops invade to restore president.1995 Saudi Arabia. U.S. soldier killed in Riyadh, Saudi Arabia outside US training facility.1996 Saudi Arabia. Nineteen U.S. service personnel die in blast at Saudi Air Base.1998 Sudan. Operation Infinite Reach. U.S. cruise missiles fired at pharmaceutical plant thought to be terrorist center.1998 Afghanistan. Operation Infinite Reach. U.S. fires 75 cruise missiles on four training camps.1998 Iraq. Operation Desert Fox. U.S. Naval bombing Iraq from striker jets and cruise missiles after weapons inspectors report Iraqi obstructions.1999 Yugoslavia. U.S. participates in months of air bombing and cruise missile strikes in Kosovo war.2000 Yemen. 17 U.S. sailors killed aboard US Navy guided missile destroyer USS Cole docked in Aden, Yemen.2001 Macedonia. U.S. military lands troops during their civil war.2001 to present Afghanistan. Operation Enduring Freedom (OEF) includes Pakistan and Uzbekistan with Afghanistan. 432 U.S. killed in those countries. Another 64 killed in other locations of OEF - Guantanamo Bay, Djibouti, Eritrea, Ethiopia, Jordan, Kenya, Kyrgyzstan, Philippines, Seychelles, Sudan, Tajikistan, Turkey and Yemen. 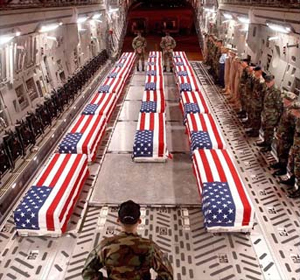 US military does not count deaths of non- US civilians, but estimates of over 8000 Afghan troops killed, over 3500 Afghan civilians killed.2002 Yemen. U.S. predator drone missile attack on Al Qaeda.2002 Philippines. U.S. sends over 1800 troops and Special Forces in mission with local military.2003-2004 Colombia. U.S. sends in 800 military to back up Columbian military troops in their civil war.2003 to present Iraq. Operation Iraqi Freedom. 4082 U.S. military killed. British medical journal Lancet estimates over 90,000 civilian deaths. Iraq Body Count estimates over 84,000 civilians killed.2005 Haiti. U.S. troops land in Haiti after elected president forced to leave.2005 Pakistan. U.S. air strikes inside Pakistan against suspected Al Qaeda, killing mostly civilians.2007 Somalia. U.S. Air Force gunship attacked suspected Al Qaeda members, U.S. Navy joins in blockade against Islamic rebels.The U.S. has the most powerful and expensive military force in the world. The U.S. is the biggest arms merchant. And the U.S. has been the most aggressive in world-wide interventions. If Memorial Day in the U.S. is supposed to be about praying for peace, the U.S. has a lot of praying (and changing) to do. Bill is a human rights lawyer and law professor at Loyola University New Orleans. His email is quigley77@gmail.comIf you wish to unsubscribe please just say so on subject line.